Alan Weil, left, editor-in-chief of Health Affairs, moderates a lively panel at a September 17 briefing in Santa Monica. With him, left to right, Walter Zelman, PhD, of California State University; Ninez A. Ponce, PhD, MPP, of UCLA; Andy Bindman, MD, of UCSF; Lucien Wulsin Jr.; and Paul Hsu, PhD, MPH, of UCLA David Geffen School of Medicine. Photos: Courtesy of Health Affairs. 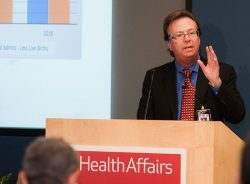 Alan Weil, editor-in-chief of Health Affairs, kicked off the four-hour briefing at the RAND Corporation headquarters by explaining that his team chose the “tantalizing” issue title to hook people nationwide and help them understand that California offers lessons about health care policies that could be emulated and others that could be critiqued or improved. The event featured 20 journal authors, each presenting a five-minute summary of his or her article. A video and a downloadable audio recording of the briefing are available on the Health Affairs website. If you don’t have four hours to spare, here are some highlights. 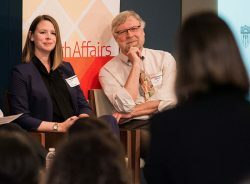 Elliott Main, MD, of the California Maternal Quality Care Collaborative, takes questions from Kaiser Health News reporter Anna Gorman, right, as copanelist Christine Thorne, MD, MPH, of UC San Diego listens. The first panel focused on delivery system innovation. Elliott Main, MD, medical director of the California Maternal Quality Care Collaborative (CMQCC), explained how his group harnesses rapid-cycle data to achieve maternity care improvements at scale. Working with the California Department of Public Health, CMQCC examined key drivers of maternal morbidity and mortality in the state and then developed provider toolkits to help hospitals address these drivers (i.e., hemorrhage, preeclampsia, overuse of c-sections). The engine of CMQCC’s work is its Maternal Data Center, a low-burden, low-cost data portal that provides hospital- and provider-specific data and benchmarking metrics (CHCF is a core funder of the data center). Collaboration with many entities throughout the state, including the government, the private sector, advocates, and consumers, has been an important ingredient in CMQCC’s success. Main emphasized that CMQCC’s work is far from finished. While Black mothers account for 5% of births in California, they experience 20% of the maternal mortality. The collaborative is doubling down on tackling this racial disparity to make childbirth safer for all mothers in California. Glenn Melnick, PhD, of the University of Southern California explains his research on market consolidation. Competition in California’s hospital market has eroded over the last 20 years, and it’s having a major impact on consumers, said Glenn Melnick, PhD, health care finance professor at the University of Southern California Price School of Public Policy, in a panel on consolidation and market power. From 1995 to 1999, a period in which growth in health insurance premiums moderated, prices paid to California hospitals were consistently in decline. Hospital prices began rising rapidly in 2001. Melnick attributed this rise in prices to the prudent layperson law and the hospital consolidation trend. He wrote about the prudent layperson law in a recent op-ed for the New York Times, describing it as “a little-known set of regulations” that “have granted hospitals what is essentially a monopoly over emergency room patients, allowing them to charge basically whatever they want.” Hospital representatives sharply dispute his interpretation. Melnick implored the public and private sectors to revive the competitive conditions needed to lower the cost of health care in California by working together. “Will the changes come quickly enough?” he asked. Arturo Vargas Bustamante, PhD, MPP, of UCLA describes his research on Latinos in California. Did implementation of the Affordable Care Act (ACA) affect health insurance coverage and access to health care for adult Latinos? 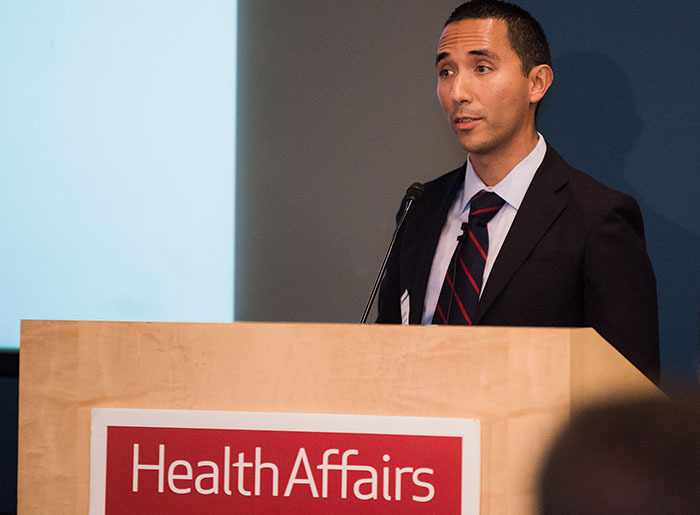 After the implementation of the main provisions of the ACA in California, coverage increased for Latino populations, said Arturo Vargas Bustamante, PhD, MPP, associate professor at the UCLA Fielding School of Public Health. These coverage increases were driven largely by public health insurance expansion. But Vargas Bustamante’s research also showed that coverage disparities persist between Mexicans and other Latinos. Undocumented immigrants are overrepresented among Mexican Latinos, and immigration status still plays a major role in predicting coverage disparities between Mexicans and other Latinos, he said. “If Mexican Latinos had had the same share of undocumented immigrants as other Latinos, disparities in health insurance coverage would have declined by 24.17%,” the study said. There may be opportunities for California to reduce these disparities. Vargas Bustamante and his co-authors suggest the state should investigate proposals to expand Medi-Cal eligibility to low-income undocumented residents or to allow undocumented residents to purchase health insurance through Covered California. 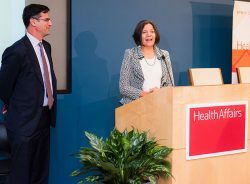 Blue Shield Foundation President Peter Long, PhD, and California Health Care Foundation President Sandra R. Hernández, MD, thank Health Affairs for staging the California briefing. The event ended with a lively attempt by authors to prognosticate about health care in California. Andy Bindman, MD, professor of medicine at UCSF and former director of the US Agency for Health Care Research and Quality, emphasized that many of California’s remaining uninsured individuals are undocumented adults. Devising ways to reach this population could be the key to achieving universal coverage. CHCF is pleased to announce that Health Affairs is holding a health policy briefing in Sacramento next month. If you didn’t get to join us in Santa Monica to learn about health and health care in California, you’ll get another chance on October 15, 2018, to hear from expert panels on important health policy issues. We’ll provide details and registration information as soon as they are finalized. Are you planning to attend the Health Affairs issue briefing in Sacramento? Let me know — tweet at me with #EssentialCoverage or email me.